RIVERS — Daniel Kiazyk laughs as he recalls the shock on the face of local councillors when two of his students stood in front of Riverdale council and asked for an excavator. The councillors were impressed, Kiazyk said, of the well-articulated pitch from two of his students. The girls wanted thousands of dollars to have a trench dug, linking two of the deepest water retention spots at a wetland under construction in Rivers. Municipal council decided against their ask, but in every other occasion when Kiazyk’s class of teenagers asked for something, he notes, the adult politicians approved it. The students asked for a bus loop and got it. They wanted to eradicate an invasive species and reseed an area with native prairie grass, and they got the go-ahead, too. That initiative, just a hint of the multi-year effort at Rivers Collegiate to implement environmental learning throughout their school, is again being recognized nationally. The Canadian Network for Environmental Education and Communication recently crowned Rivers Collegiate with a 2017 award of excellence in environmental education. The school won in the kindergarten to Grade 12 category. Rivers students have been involved in developing signage, creating an alternative wind power source and building bird houses, docks and walkways to place at a wetland site that was once a gravel pit. School officials acknowledged their award on Friday at a ceremony for the official opening for the Rivers Wetland Centre of Excellence, a natural habitat the school itself is developing. Numerous partners have come on board to help with cultivating the wetlands, including Ducks Unlimited, which provided initial funding. “You are doing what educators across the country wish their kids would do,” said Barrett Miller with FortWhyte Alive, an environmental and recreation centre in Winnipeg. 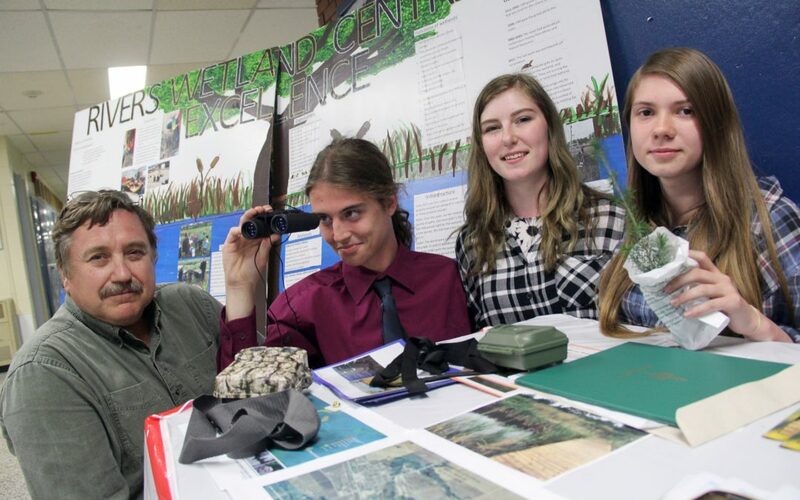 In addition to the school-wide effort to integrate environmental teachings wherever possible, Rivers Collegiate credits two of its classes, the Grade 9-10 outdoor education course and the Grade 11-12 wetlands management class, with leading the charge. In Grade 9-10, students learn about ecology and sustainability and take action on causes they’re passionate about. They’ve led garbage audits in the school, advocated for idle-free zones for vehicles and asked for a water bottle filling stations in the hallway. “We actually have kids, at the end of Grade 10, who could become interpreters at Riding Mountain National Park,” Kiazyk said. In the wetlands management course, students essentially become the brains behind the wetland. They’ve asked municipal councillors for money and filed grants with other organizations. They helped carve a walking path and the shelter for an open-air classroom. One of the class’ main projects is to teach a group of Grade 4 students about wetlands, planning a full day of lessons and activities. On many occasions, students in the wetlands management class get their community and other classes involved. “It’s really interesting,” said Emma Gray, a Grade 12 student. Trained in the humanities, Kiazyk didn’t expect to become educated in the environmental sciences, but it’s proven to be rewarding. As much as possible, he said it’s the students who come up with plans for the wetlands and devise a teaching plan for when Grade 4 students come to learn.